LOS ANGELES -- Please excuse Anaheim Ducks General Manager Bob Murray and coach Randy Carlyle while they awake from a state of disbelief. After all, when one of the highly-touted defensive prospects falls to you at the 12th pick of the first round, you tend to be a bit surprised. 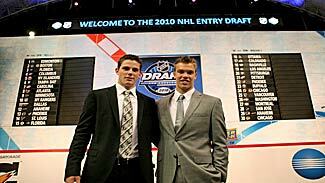 But there was Cam Fowler, a 6-foot-1, 190-pound defenseman projected to go as high as third on some draft boards, staring the Ducks right in the face when the 12th pick rolled around at the 2010 Entry Draft at Staples Center. For Anaheim, the decision was a relatively easy one. For Fowler, it was a pretty tense situation, but one that didn't seem to rattle the 18-year-old resident of Northville, Mich.
"It's hard when you have high expectations for yourself because some people are saying one thing and some are saying something else, but when it comes down to it, I'm a firm believer that everything happens for a reason and I think I just fell into a great organization," Fowler told NHL.com. "When it's all said and done, it doesn't really matter what number you go, it's how you can contribute to your team and what you could do to get to that next level, so I'm just happy to be a Duck." Fowler, who scored 55 points in 55 games with the Windsor Spitfires of the Ontario Hockey League this past season, also led all defensemen in the 2010 Memorial Cup in scoring with 2 goals and 6 points. As a member of Team USA, he won a gold medal at the 2010 World Junior Championships and at the 2009 Under-18 World Championships. "I'd like to think (Anaheim got a steal)," Fowler said. "I think I've proven myself over the last couple of years that I could step up in big games and make a difference, but these NHL teams that drafted before me got some great players too. What it all comes down to, we're all trying to work and achieve that goal to ultimately make an NHL team and that's my main goal right now." As ecstatic as the Ducks were to get Fowler, it was stunning to see him available at that spot, particularly after the NHL's Central Scouting rated him the fifth-best skater on the final North American list in April. As if the waiting wasn't the hardest part, Fowler also was booed when his name was announced since the Ducks just so happen to be the biggest rival of hometown Los Angeles Kings. Fowler took it all in stride. "It gave me a taste of the rivalry, but I think it's great to hear such a reaction from the crowd, especially on the West Coast," he said. "We have a great rivalry here and it just means that hockey's expanding and these Kings fans are crazy about their team." Fowler, while dismissing the rumor that his parents had secretly wished Anaheim would be his destination, did reveal a big smile when NHL.com posed the question. "My parents have supported me and whoever picked me this year, they were going to be behind me," he said. "But my agency is out here in California and they were happy to have me here. I have some ties since I went to the camp that coach Newell Brown hosted out here and lived at his house for a week and developed a great relationship with him. I do have some connections with the organization and it just seems like everything fell into place." Additionally, Fowler did admit to having a special place in his heart for the Ducks and recently retired defenseman Scott Niedermayer -- who, incidentally, was at Anaheim's draft table, to the delight of Fowler. "That was such an honor for me to go up on the stage and shake (Niedermayer's) hand," Fowler said. "He's someone that I've followed ever since I was young, and somebody that I try to pattern my game after. It was huge for me to shake his hand and be a part of an organization that he was a part of. "I was a huge fan when they were making the Mighty Ducks movies," he added. "I was actually sad to see those purple jerseys go, but this franchise has done so much over the past years and there are so many key players in place; it's awesome to be part of it." Actually, as it turns out, the personnel of the Ducks weren't the only individuals stunned to see Fowler available at No. 12. National Team Developmental Program goalie Jack Campbell, who was plucked one spot before Fowler by the Dallas Stars, was equally surprised. "I don't know how Cam Fowler got to 12," Campbell told NHL.com. "Anaheim got, in my opinion, the best player in the Draft. Cam is going to have an unbelievable career in the NHL."